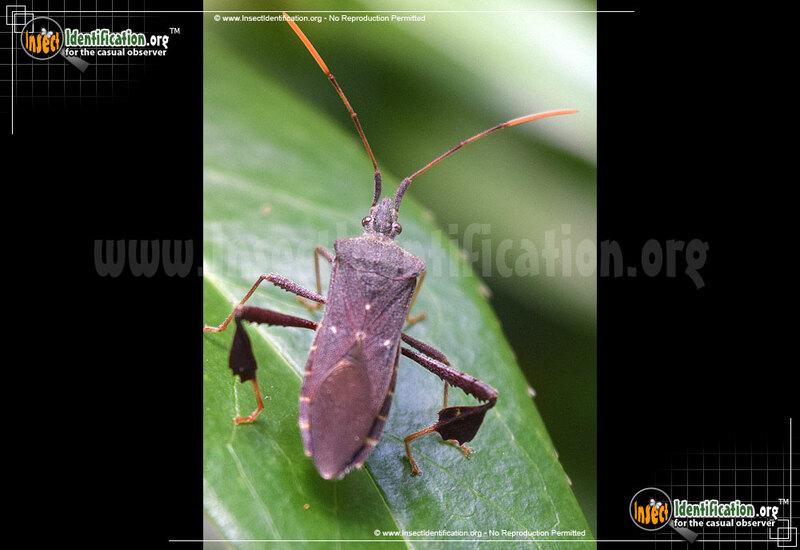 Detailing the physical features, habits, territorial reach and other identifying qualities of the Leaf-Footed Bug. Leaf-footed Bug have flattened 'thighs', not feet, that are shaped like leaves, complete with serrated edges. 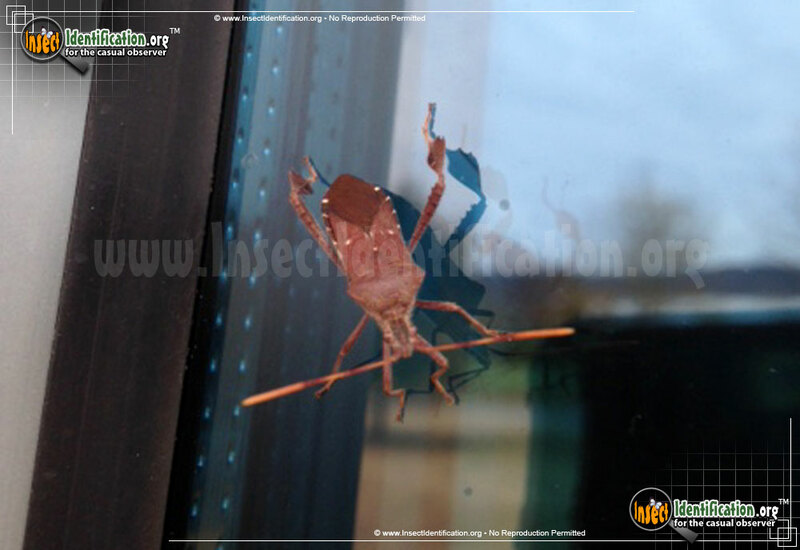 Leptoglossus oppositus is a species of Leaf-footed Bug found mostly in the eastern part of the continent as well as south into Central America. Adults are a reddish brown and have a white dot at the center of the wings. Two other white dots further down form a triangular 'constellation' on the dorsal (back) side. These dots may be remnants of what almost became a white band crossing the mid-section (seen on some of its relatives). The legs of this insect get most of the attention, however, thanks to their peculiar shape. Flat and oblong, the lower leg (tibia) is edged in a spiky scallop. It has the appearance of a small dry leaf, hence the descriptive common name. The edge of the upper leg ('thigh') is also lined with small serrated 'teeth'. These are used to fight with other males over females. Leaf-footed Bugs can release a stinky secretion as a defensive mechanism if threatened. Juveniles look like smaller, short-winged versions of adults. This species feeds on, and is fond of, the pods that grow on catalpa trees, a native American genus of trees that is common in the South. Also called Catawba, Indian bean trees, and Southern Catalpa, these trees grow long skinny fruit shaped like green beans. Leptoglossus oppositus uses it mouth parts to pierce the pod and drink plant juices, though it is not considered a pest.